The wave of modern furniture that we are stepping down from sheds the symbolism of furniture for tact. Modern furnitures are mobile, flexible, stripped down functional expedients. Though very rational, there is a certain impoverishment to them; an absence of style, and an absence of meaning. 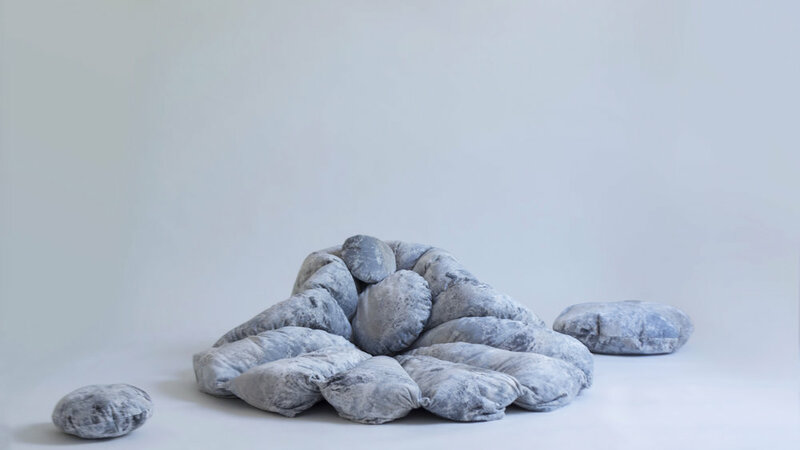 It is no surprise then that in many current furniture trends we can see everything that modern is not—Colorful, over the top things: lumpy, stylized, narrative, highly textured, unclean, even unusable. 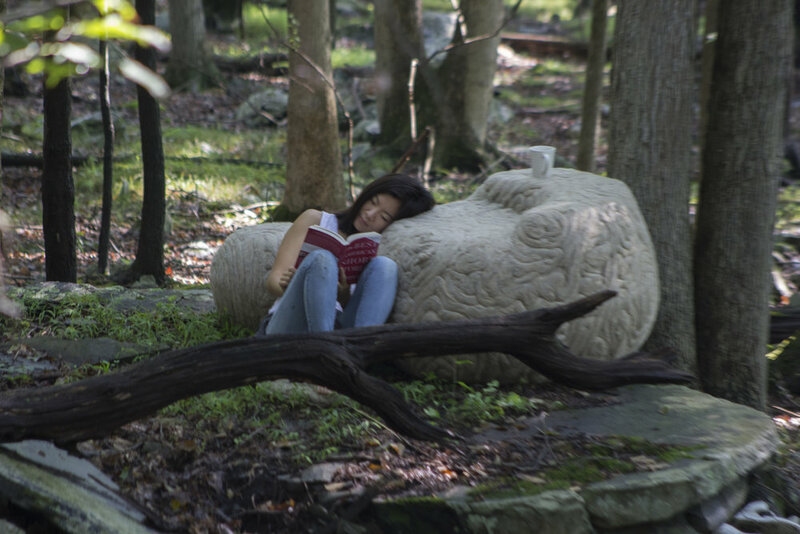 From the Upper East Side to East Stroudsburg: A spot in a landscape. Lunch periods, after school, we rollerbladed for miles, climbed up embankments, found ourselves laying on warm, sunny stones, arranged just so. Even city kids could learn to appreciate nature in a place as tame and accommodating as this. This is where I learned to find comfort in a landscape. Central Park is not nature; It is an idealized version of it. As I would learn in architecture school years later, its architect, Frederick Law Olmstead, envisioned the park as an endless painting, with every path leading to a new view, every turn into an idyllic new frame, every close look at the scene to an inhabitable spot to plant yourself. Every tree in the place was planted deliberately, and every boulder and smatter of rocks, planted too. I only learned to see the artifice when my parents moved to the mountains of East Stroudsburg, Pennsylvania, but I did not learn to hate my old stomping grounds. I realized we could draw from this beauty and harness something that was there. This “Snug Stone” is partially upholstered with garden gate springs, which produce an indescribable, comfortable and uniquely delightful seat shifting motion. The small stone holds a pocket of air, the smallest, latex. The homogeny of felt obscures the mixture of secret textures, and an experience only understandable through actual occupation. In the largest, the higher level is solid, while the lower (with the gate springs) is excessively accommodating. In my dreams, an abundance of these stones, at different heights and different sizes would encourage a person to discover their own place in the landscape they create on their own. The wool is invitingly soft and warm. Embrace exploration, and then settle in. My favorite thing about wood furniture is the feeling that comes from running my hands across it and imagining I can feel its maker’s experience. One of the most beautiful parts about learning a craft is being granted the power to read into the stories that objects carry. The hand lives on in the things that it has done. We lead with our hands, into people, new objects, and places. I’ve always loved the idea of a handle of an object being the hand of it. A teapot can say “hello, please hold me this way.” And to “shake the hand(le)” of a building before entering is as a means of introduction to a space. Our daily lives are full of mundane experiences in which our hands are so quietly involved that we can forget how dependent on them we really are. 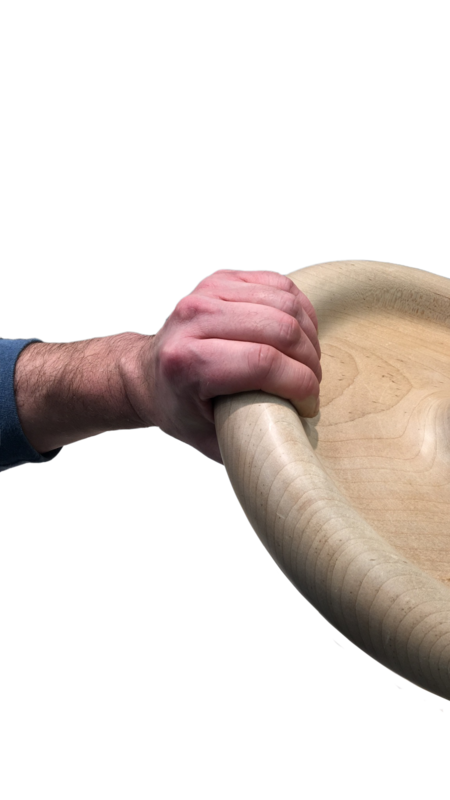 This work is a woodturner’s meditation on the hand. It is based on my own hands, turned into accommodating gestures that hope to communicate an experience of making and turning, learning and listening, and holding and molding—from my hand to yours. There are ways to hold things, and cups, that make you feel confidence. When did you last hug a mug? from a particularly inspiring definition of "Bowl" which described it as "A simple device for stabilizing food." Inspired by the way a chalice projects an image of power to others, crossed with the body language necessary to grab a cup by its base, You drink with power, and never put it down. Lonely? Grab a cup. Loneliness never felt so good. Like holding a new hand for the first time. The very first small latte turned into a grabbable cactus. When I realized the flange was not working in my favor, I nixed it. Then I realized sharp corners were not working in my favor and nixed those. When I finally decided to buckle down on a shape, I made the shape which was in the curve of my hand this whole time. Duh. Made in memory of Phil Brown, a kind and incredible turner who housed the Windgate ITE and gave us wood from his woodpile just before he passed away. This beautiful figured cherry was from that day, and has been offered to the center for Art in Wood, of which he was a huge part. Thank you Phil. The tiny wearable munchkins of the family. Worn between the fingers. Smooth and irresistable, the negative of the tops are reciprocated on the bottoms--- enough for one, or two hands to offer. They don't show up in photographs, but the most important things never do anyway. I’ve never had a very good memory and that’s why, I think, I hold on to objects so tightly. I think we all do this to some extent. Some things are touch points, others are memories, some things we think are beautiful and just want to keep close to us. If not for our connection to them, objects on display are on display for others, not ourselves. We display for ourselves, though. Surround ourselves with things we give meaning to, and in return those things give our houses the warmth and comfort of home. As a designer, I can do what I was taught, and break it down. What are these things, what do they have in common, what do they look like that we would give them a place and power in our homes? It’s all so arbitrary. That’s what’s compelling about the personal connection, and what makes it special and yours. It feels like fate. I could never presume to design for others an object programmed to be loved in this way. I might permit myself to house it, protect it, and cherish it. Can I make something that strengthens the bond we have with these things? Can I bring them closer to us? Make us more aware of them? Bring them out of basements and junk drawers and into our lines of sight and into our pockets? The way you’d box a brittle set of books. And the dark takes place between the rafters. pinning it to the ground by the throat. And the stars whistle over your head. After turning a pattern of beads to the dimensions of my hand, removing 1/4 of the spindle results in a 3/4 spindle that can be applied to any square edge surface, to make grabbing that edge instantly satisfying instead of slightly unpleasant. This simple piece of furniture frames this functional detail. Form follows function and spoils you a little. I love the malleability of a good, solid comforter: the way, balled up, pulled under, or bunched across, a comforter is the perfect piece of furniture in the land of the bed. I have never been more comfortable than in the corner of my bed, with my comforter tossed in, then pulled and pushed just so. 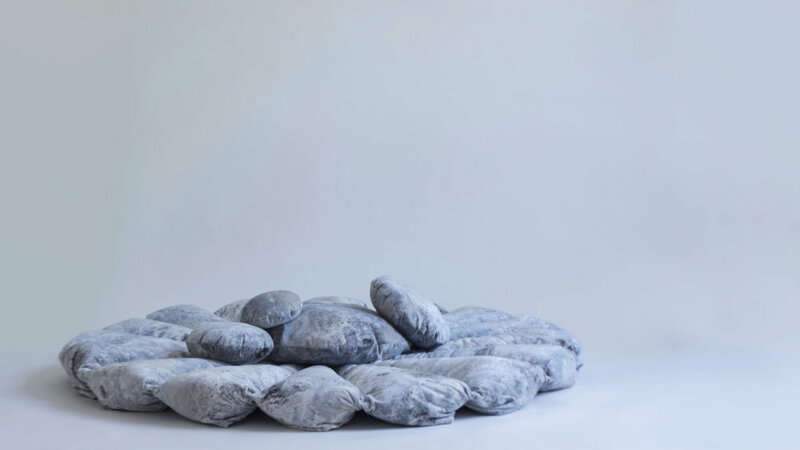 “Concrete Comforter” brings the comforter out of the bed and into the room, imbuing it with the structure, durability, and stability of furniture. 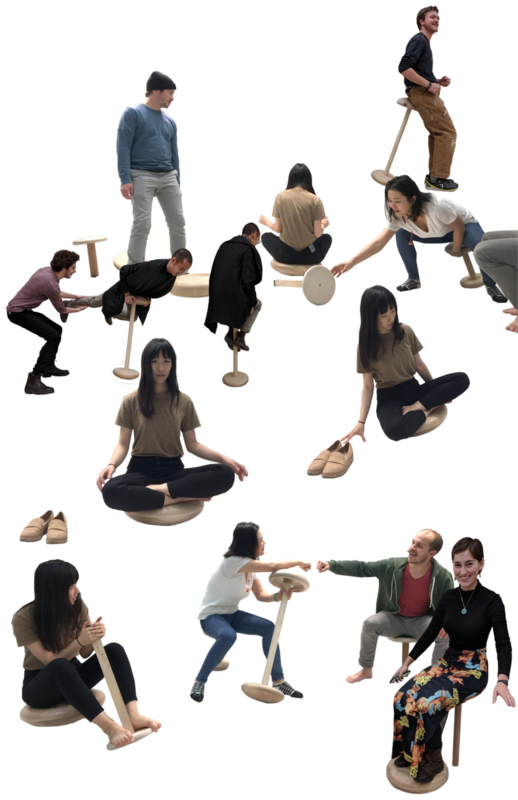 A family of stools pushing the “one-legged stool” typology as far as it can go. 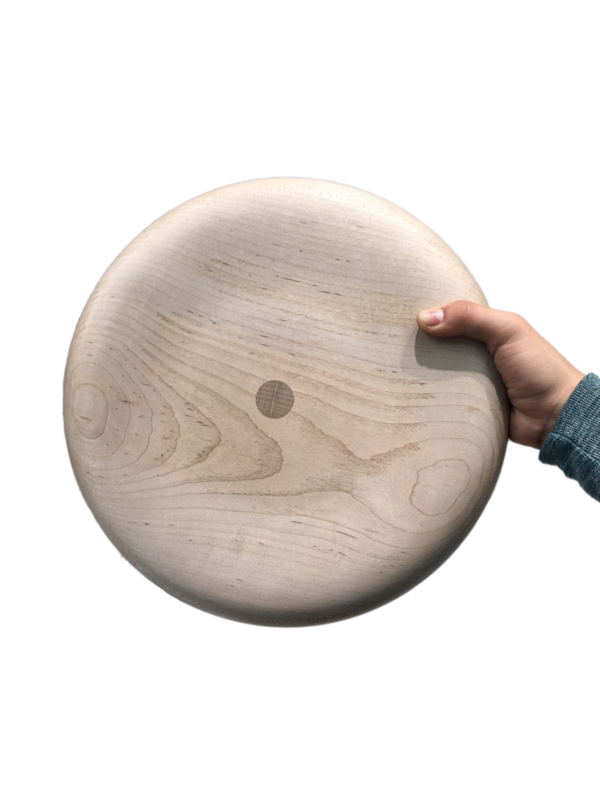 This mixture of mockups and finished pieces, when put in the hands of curious people, results in a cross-pollination of discoveries, combinations, uses, and postures. I love watching people make sense of objects which have no strict pre-determined single function or orientation. Even small variations in height, width, weight, etc. result in totally different sitting and playing experiences. Perches become rolling ottomans, seats become slumping devices… a combination of two chairs actually becomes a vehicle that can propel you forward, wriglingly, snakingly. Body at Work was based on the body shifts observed in a series of life-scale portraits, Body of Work, in combination with extensive experimentation exploring the ways in which we can reinvigorate and redefine turning’s role in furniture. 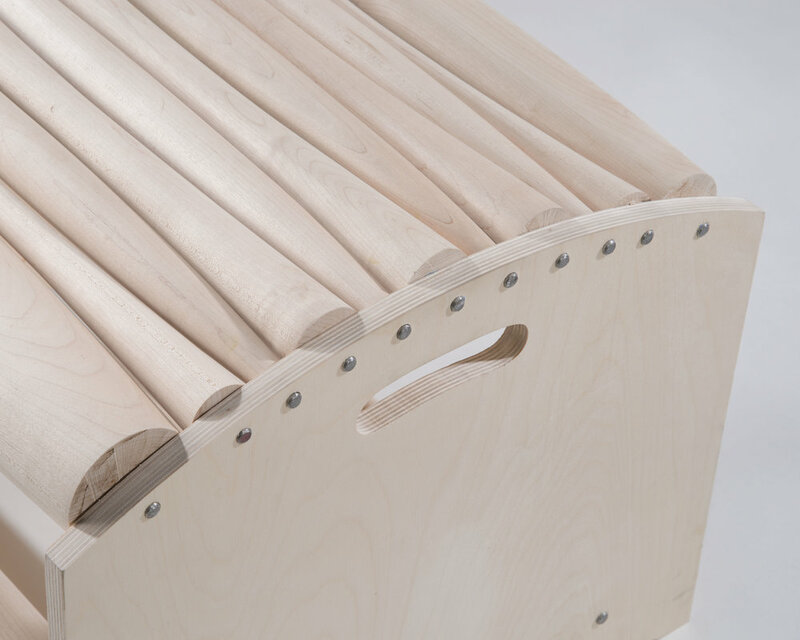 This seat accommodates for the way we work while “sitting still,” taking advantage of three qualities expressed uniquely in turned things: how the human body loves doubly-curved surfaces, how nesting profiles can combine to create complex surfaces, and how things turned can turn again once taken off the lathe. The seat is surprisingly comfortable and liberating. The complex curved surface created by the aggregate of hard maple spindles is actually surprisingly comfortable! The body loves doubly curved surfaces, and that is the beauty of spindles, bowls, and any turned shapes in relation to humans.